VaproShield Membranes Approved by Air Barrier Association of America ABAA evaluated small VaproShield’s innovative self-adhered vapor permeable, water resistive air barrier membranes: WrapShield SA Self-Adhered and RevealShield SA Self-Adhered (for open joint rain screen cladding systems) received approval from Air Barrier Association of America (ABAA) on April 20, 2015. Both approved membranes are fully self-adhered water resistive barriers (ARB) and air barriers with a cutting edge adhesive that does not require primers, is void of VOC’s, and can be applied in below freezing temperatures. Click here for more info. Cement Board Fabricators distributes VaproShield® for roofs and walls. RevealShield SA Self-Adhered a black UV stable, highly vapor permeable Water Resistive Barrier (WRB) Air Barrier (AB) sheet membrane. RevealShield SA is the most technologically advanced product as well as the most efficient application for open joint rain screen cladding system on the market. Click here to see the Product Guide. 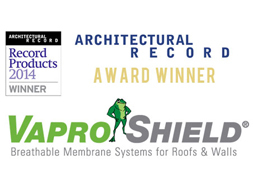 Architectural Record Magazine, the #1 source for architecture design, modern architecture, and green architecture, recognized REVEALSHIELD SA™ SELF-ADHERED as one of the year’s most innovative and useful building products of 2014 in its annual Record Products competition. • Click here to learn about RevealFlashing. • Click here to learn about VaproLiqui-Flash.